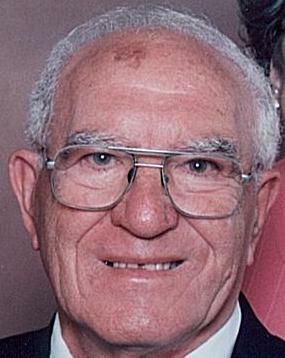 Santo T. Scardella, 87, of Syracuse, passed away Monday at Loretto, Syracuse. Born in Fulton, he was a long time resident of the Fulton area. He was an Army veteran of World War II as a Master Sgt. of the Calvary having received the Bronze Star for Valor at the Invasion of Normandy. Santo was a communicant of The Church of the Immaculate Conception in Fulton where he and his wife were the captains of Bingo. He retired from Sealright in 1986 after 45 years. Santo was a self-employed electrician. He was predeceased by his parents, Domenico and Clemintina Buccitto Scardella; his siblings, Palma Cardinalli, Josephine Genung Patane, James Scardella and Tony Scardella, his twin brother. Santo is survived by his wife of 60 years, Edna Verdi Scardella; three sons, Dr. Anthony (Susan) Scardella of NJ and their children, Lauren, David and Amy; Rev. Joseph E. Scardella of Syracuse and John (Michele) Scardella of Oswego and his sons, Thomas and Brian; his youngest sister, Nancy Coulter of TX; nieces and nephews. Prayer services will be held 9:30 a.m. Friday at Foster Funeral Home, with a Mass of Christian Burial 10 a.m. at Holy Trinity Church, corner of Rochester & South Third St., Fulton. Burial will be at St. Maryâ€™s Cemetery, Fulton. Calling hours are 4 to 8 p.m. Thursday at Foster Funeral Home, 910 Fay St., Fulton. Contributions may be made to the Alzheimerâ€™s Assoc., CNY Chapter, 441 West Kirkpatrick St., Syracuse, 13204 or to Holy Trinity Church, 309 Buffalo St., Fulton, 13069.